I want to start by sending Gabriella’s and my love, prayers, thoughts, and hope to all those effected by the recent earthquakes in Japan and New Zealand. Clearly the tsunami in Japan was behind the majority of the death and damage, but the impact that earthquakes are having around the world on human populations cannot be missed. As is often the case with deaths associated with earthquakes, the housing in which people live can either be the shelter they so desperately need or a deathtrap. Over the years, many people have looked long and hard at how straw bale structures perform in earthquakes. From the early pioneers such as Bruce King (who identified the seismic resistance qualities of straw bale construction) to the recent work done by Darcey Donovan (who spearheaded the shake table study at the University of Nevada, Reno shown above) these engineers and many others like them have long touted straw bale construction as a smart choice in earthquake prone areas. Let’s take a look at why. Shear Design. 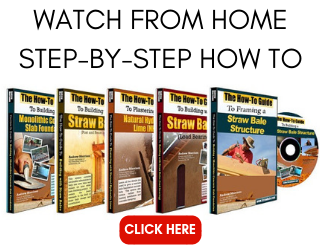 When building post and beam structures, the most commonly utilized straw bale design, the frame itself is braced to resist lateral shear. Lateral shear is the force that is applied to a building in the same plane as the wall it is being applied to. In other words, if you stand at the corner of a building and push, you are applying lateral shear force to the wall you are pushing. The frame itself will be engineered to resits this shear force as the primary defense. Redundant Design. 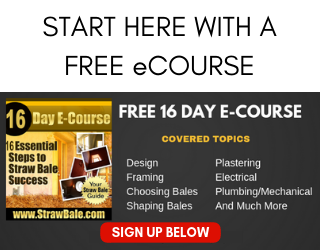 The bales, attached to and notched around the framing, act as secondary shear resistance. This “backup system” adds significant strength to the overall wall assembly. Natural Structural Insulated Panels (SIPs). The bales and the plaster are joined as one during the construction process. The combination of the two materials makes a natural SIPs panel which is amazingly strong. It is the combination of the rigid plaster skins with the soft bale interior that makes this structural assembly extremely strong. Wide Footprint. The bales are wide, much wider than a conventionally framed wall, and as such, they have a wider footprint onto which they can spread any load applied during an earthquake. Soft and Supple. The bales respond to seismic forces differently than conventional construction materials. In most of the conventional construction systems used here in the United States, the materials are designed to resist external forces (wind, earthquakes, etc…). Bales, on the other hand, are very good at simply absorbing those forces. Their ability to move, even in the most subtle ways, allows them to deflect much of the energy that would otherwise cause failure in rigid building materials. Stronger Sills. I always use 4×4 sill plates/toe ups. These thicker, stronger boards are able to resist more force than a single or even doubled up 2x board. This is often the difference between a structure holding firm and breaking away from its foundation. (Another potential cause of such a failure is too small of a washer on the anchor blot itself, but that’s another story). It’s important to remember in construction that a building acts as a unit. In other words, you cannot think only about the shear strength of the walls or the ability of the roof to resist winds. When wind pushes up on the roof, the roof wants to lift off of the walls and the walls want to either go with the roof or collapse into the home. The connections at every point through the house have to be considered and built to withstand the forces that can and will act upon them. I’ve heard from many people who live in straw bale homes that their properties have done well in earthquakes. There are a lot of engineering numbers out there to support this idea too. Like I said earlier, a lot has been done to understand just how safe a straw bale building can be. I, for one, would like to hear more as we see the level and intensity of earthquakes increase. If you know of any other studies of value, please let me know. I plan to undertake a comparison study in the near future testing the strengths and differences of post and beam bale walls, load bearing bale walls, and conventionally framed walls. If you are interested in helping out with this, please let me know. I already have an engineer on board, Nabil Taha of Precision Structural Engineering, Inc. 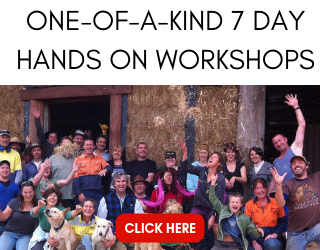 He is very excited and passionate about this project and straw bale construction in general. We are looking for help finding funding, most likely by means of writing a grant request. In addition, we would love to have some people who are excited about this idea on board to help with all the many details that will arise from the project. Exactly what that means, I don’t yet know! Please leave a comment here if you are interested in helping in any way or if you know of other folks currently working on a similar project/study. Thanks. Andrew, I like your account of the earthquake worthiness of straw buildings such as those you describe. You’re basically describing a well-engineered post and beam building with straw infill to which plaster and wire mesh are attached directly. That’s a lot of caveats! But such a building is indeed probably as earthquake worthy as any conventional carefully engineered building. Which is important for less experienced baler enthusiasts to realize. There’s nothing inherently earthquake worthy about a building just because it’s made of straw. In fact, within the strawbale community there are a lot of what are essentially strawbale shanties, built with great enthusiasm and vision, but little understanding of engineering or construction detailing. The earthquake worthiness of such buildings is highly dubious, especially if straw is holding the whole thing up. So, please be careful when beating the drum for earthquake worthiness to continue to make clear the prerequisite necessity for good engineering. As for load-bearing straw buildings in earthquake country, I have worked with an engineer who insists they’re great, but many would disagree. Myself, living in earthquake country, I want a sure thing: a braced frame building (to keep the roof up) to which straw “SIPs” add a bit more “insurance.” There are just too many possible construction errors that could cause a roof to come crashing down in an all-straw structure for me to feel comfortable being there. Perhaps your study will verify this, or show that my gut feeling is over-reactive. In any event, your projected study sounds like a good one. Count me in. I can write specs, discovery notes, reports, and CAD drawings. I am a retired civil designer and I’m very familiar with online design projects. I also own http://www.GlobalFamilySurvival.com. We promote sustainable living and straw bale construction. I plan on attending one of your workshops and when it comes time for me to build my house, I want to host one of your workshop. Do you know or have designs for a straw bale summer home? We would be interested in knowing where to find. I lived in a strawbale house around the wabash/new madrid fault. There was a 5.0 earthquake early one morning. the noise of the earth woke me up, and i realized we were having an earthquake and braced myself, quickly checking to made sure i was away from windows, and hanging items (i was in bed and this took only seconds) i pulled the covers over my head and prepared for the worse, i felt a wave roll from the north to the south, almost like i was in a boat, no damage, no shaking, just a rolling wave. then i laughed and was very happy to have had this experience in a straw bale building. i learned later that day that many people sustained cracks, and had things flying of the walls and shelves. my mother even felt the earthquake 350 miles away, but we were fine. just thought you might want to know. ps keep up the great newsletter! Hi Joanne and Luigi. What do you mean by a “summer home”? I know some people’s idea of a summer home is a 500 SF cottage while for others it’s a 5000 SF mansion! I’m currently working on a new website that will offer all kinds of straw bale home designs from different architects. It’s not up and running yet, but it’s coming…It will be http://www.StrawBalePlans.com. Let me know what you are looking for in some more detail and I will see if I have access to something that will work for you. Fantastic Paula! Thank you so much for your offer of help. Welcome to the team! My plan is to compile a plan of action and then contact everyone who has expressed an interest in helping to then execute that plan. I am leaving for Australia in a couple days to teach a workshop, so I won’t be back on this for another 2 weeks or so. Again, thank you and we’ll be in touch soon. Excellent. Thank you Michael. I will be in touch in a couple weeks, once I get back from teaching my workshop in Australia. I’m excited to get started and really appreciate your offer of help. Thanks Richard. I agree whole heartily that there are some shanty straw bale buildings and I might even continue to say builders out there. I have seen many people step into the role of teacher in their local community without having any construction experience under their belt. It worries me. I have even seen bale and cob combination structures fall over after only a few short weeks on the planet and not as a result of earthquakes, just poor detailing. I certainly do not want to be on the same side as anyone beating a drum of worthiness for a structure like that. That’s exactly why I am interested in the study. I am a scientist by schooling (geologist) and a contractor/builder by trade now taking those aspect in combination to teach others. I trust that the study we complete will be clear and answer many questions. I too hope to prove wrong your concern about load bearing structures as I believe they are most definitely worthy of praise; however, that is my gut feeling, not something that is based entirely on study which would make my inner scientist much happier! Excellent! I don’t know straw bale houses can withstand the force of the earthquake. Innovative design houses with earthquake protection are necessary these days. Does anyone know of straw bale buildings here in New Zealand or in Japan that were in the earthquakes and how they stood up? A mud brick building was on TV near Christchurch, basically a write-off! Hi Gordon. My wife has been looking into this as well. I’ll ask her when she gets back what she has discovered. Mud brick is certainly no match for an earthquake as such a structure has zero tensile strength. Its compressive strength is high, but a quake does not apply loads in that fashion. Bale structures are very different as they provide both compressive strength in the rigid skins and tensile strength in the pliable bales. They are much more suited to both resisting and, perhaps more importantly, absorbing seismic energy. Hi Andrew. I like Gordon i live in Aotearoa/New Zealand and am also interested in how straw bale building s held up. I live in Lower Hutt City- within the Greater Wellington Region (capital)which is located directly on top of one of the Pacific Fault lines. It is just a matter of time before the big one hits us. Im interested in knowing the properties of straw bale homes/ structures when firstly, earthquakes occur and secondly, in contact with liquidfaction. Chiristchurch experienced/still experiencing with after shock a lot of this. There are areas within the city where i live where it is predicted that liquidfaction would also be an issue following an earthquake. Look forward to anyones response on this. My point here is that whether the house is made of bales of concrete block or dirt, won’t matter much in terms of liquefaction. Where the material does matter is during the actual earthquake event and that is where straw bale is said to do really well. Once we get additional data, I will be sure to share it with you all. I am wondering about straw bale construction where the water table is at or sometimes above ground level. Is construction possible? Hi Sharon. It is possible; however, you’ll have to build a drainage system to move water away from the slab or build the structure up on a raised foundation. Additional drainage should be in place regardless of the system you choose for the foundation to move excess water away from the structure to keep moisture levels low in the walls. I am moving/retiring to Ecuador from CA. Are you aware of any experienced straw bale builders any where in Ecuador? Sorry Summer. I am not. Best of luck in the move. Great site, thanks. I’m a British archaeologist and educator now based in Puebla, Mexico. Since childhood I have yearned to build my own cob house, but since reading info here on your site, I have become interested in Strawbale as a more viable option for this seismic zone. I’m hoping to establish an alternative technology center to show case sustainable methods of living and building. Can you offer any help or advice on building in a seismic zone when using a reciprical roof? Many thanks! Hi Lawrence. I don’t have enough experience with reciprocal roofs to comment on that. I do know that bale walls, when built right, have great resistance to seismic movements. Hi Andrew, I am looking into building an educational facility for all ages focusing on aquaponics (fish and plants) and looking at a piece of land along a railroad that runs trains every 10-15 minutes. Not quite the same as earthquakes but constant shaking none the less. I love to read about your many projects and hope to build with straw soon. Sounds great. Bales would be good for that environment and should help dampen the sound of the trains. Hi Andrew, our straw bale home – situated approximately 45km’s from the centre of Christchurch, New Zealand – was subjected to all of the big earthquakes which struck Christchurch 2010 – 2011. No structural damage occurred, just some hairline cracking to cement plaster walls. I’m not sure where your research project is at but I am happy to help in any way I can. My skill base is in research and writing but I’m open to helping out in other ways. Very informative. I am wondering if the originsl, now defunct apparently practice of pinning the strawbale courses with sharpened bamboo poles would add to seismic resostence…or tather adaptability. Also, would a flexible mesh over the raw wall–like larger holed window screening rather than chicken wire would help. Then perhaps on the inside the final finish layer could be mixed with latex paint. Thus reducing hairline fractures during a seismic event. In hurricane areas, the roof over hang could be engineered to be break-away. Round houses and domed roofs could help in such an area as well. In Ireland , the old cottages have ropes thrown over the thatched roofs, with heavy stones tied to the ends. Or…The roofs could be made easily replaceable. Emergency cellar shelters could be useful with this. Just big enough for the tenants to lie in. yes straw bale walls are flexible and therefore useful in building in areas exposed to earth quakes. And the material is not expensive, and often available locally. Further more, straw is insulating, natural, familiar, beautiful and light weight! What can be done to mini mize those disadvantages? – high insurance fees are easily compensated by achieving really low cost building! Hi Tommy. Thanks for your comments. I want to address a couple of the “disadvantages” you mention in your comments. 1. It is very rare to have insects in a bale wall system if it is well built. The idea that you will have bugs in your walls is more of a myth than a reality. If you source your bales well, you can get organic straw with no pesticides at all. 2. Bale walls have been shown through ASTM testing to have a higher resistance to flame spread than conventional walls. in other words, they will not catch fire. That is a myth. 3. Insurance can be difficult to get, but it’s not typically that much more expensive than conventional construction, especially with the IRC code in effect. I just want to make sure we don’t spread rumors or add to the existing myths out there. Cheers. Building in LA is not only prime earthquake country, but building codes are incredibly strict. I am looking for references to site in order to sway approval of my proosed straw bale home in seismic-prone land. Any tips on finding reliable stories/articles/statistics/evaluations/reports that could support my efforts? Not a big deal at all. Straw bale construction is written in Appendix S of the 2015 IRC which means it is officially in the building code. Everything you need is in that document. There are bale homes built all over California and they are approved as code compliant. Good luck! Hello, I am considering building a mobile tiny home, i would love to incorporate stawbale, has anyone ever tried this and if not is it possible? If it is possible is a clay blend the best way for the exterior? Hi Celeste. I know of one straw bale home that was built on a trailer. It is not a practical idea though. The weight of the home is huge and not something a trailer can easily handle. Further, the movement has a tendency to crack the plaster. I am a fan of lime plaster over clay; however, if you anticipate a lot of cracks, clay is easier to patch than lime. In my opinion, earthquake damage is very dependent on the geology of the site. Building on bedrock can sustain minimal damage even directly on the fault. I have seen pictures of this. Building on sand and clay depends strongly on whether the soil is saturated or not. If dry ( down to bedrock) these structure sustain moderate damage. Building on saturated soil sustains the most damage in earthquakes. Even strong structures that resist damage will capsize like a ship. Almost all structures built on saturated soil will be completely destroyed. It is possible to make any construction more resistant to earthquakes. But it is a complicated subject and any new construction method will require design analysis and practical experience for reliable damage prediction. I really want to retire to a straw bale house. The thermal and noise insulation is very high. However, I will be living directly on the San Andreas fault so I want to be sure to get the design right. I agree with you about liquefaction as that impacts the soils beneath a house and undermines the entire thing. That is only one scenario surrounding earthquakes though, and the construction detailing that engineers use for houses of any type in high seismic areas is specific to the risks at hand. In the same way that the International Code Council (ICC) and other agencies have developed safeguards against seismic activity, so too have bale homes proved their resilience. Independent ASTM testing has shown that they do a much better job than conventional houses when compared apples to apples (i.e. a standardized ASTM testing protocol). This is something to celebrate and share with others. I’m not sure why the discussion moved to the soil below the house as a means of suggesting that the test results are not that impressive. As I said, I agree with you about the risks of the subsoil stratigraphy, but that is not the topic of this discussion. The house’s innate ability to resist seismic forces and protect its inhabitants is. Cheers.